I think I mentioned a little while back that someone from my quilling group enticed me to buy "Brusho" powdered paints... which I did. I picked up the 24pack from ColourCrafts in the UK. 27.80£ which with shipping came to $80.51 Cdn. I had asked what's so special about these powders. Why not just buy pigment powders in an art store... probably a lot cheaper in the long run that way. So this past weekend I picked up a few powder pigments by Demco (Cadmium Yellow Deep Azo, Burnt Umber, & Lamp Black) as well as some Neuberg Ebel "Sparkle Pearl" powder. Safety: using any pigment powders, please take care and use proper respiratory equipment (face mask). I cut a quick mask from some scrap cardstock on my table. Taped it to a Canson Biggie piece of CP watercolor paper (back side which is smoother). The feather on the left is using the Demco powders and the Sparkle Pearl. The one on the right uses Brusho's (Yellow, Dark Brown, Black, Gamboge). Although I like both feathers, the Brusho did disperse more easily. 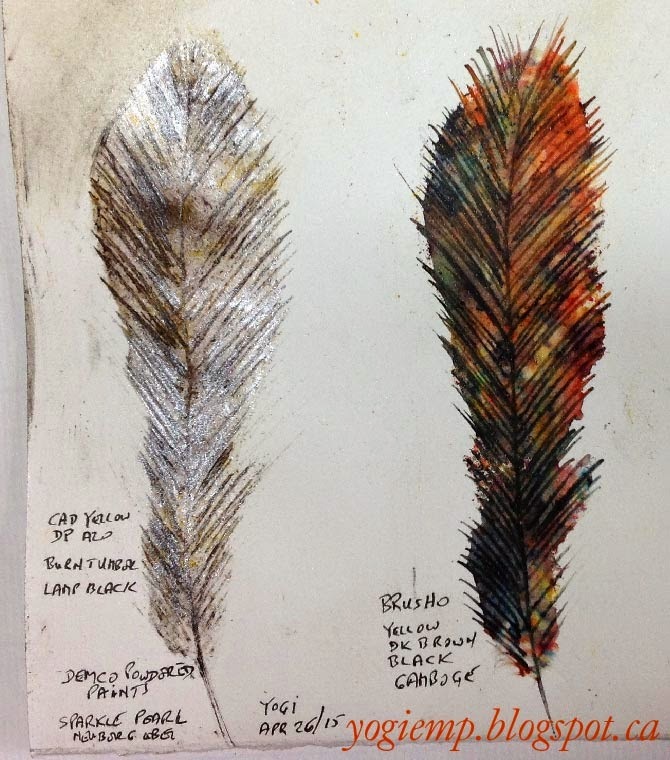 There is quite a difference between the two feathers, even though I tried to use similar colors... also the Brusho powders are more set when dry and don't seem to come off when I wipe my finger over it, whereas the Demco will definitely need a fixative. I was still able to move color around on the Brusho feather with a wet paint brush. I started by wetting the paper through the mask with a flat brush, sprinkled the powder and then misted with water. allowed the colors to move and blotted up areas that were too wet. removed the mask and while paint was still wet, used the small end of a balled stylus to scratch my feather details - quick flick movement. The only really negative thing I have to say about the Brusho product, is I really don't like that the lid doesn't come off easily and I have to punch a hole in the top to sprinkle out the color. OK I was totally frustrated not getting this lid off so I used a screw driver to pry it off. I definitely can not get it off using only my fingers... Sigh!! I have been hearing about Brushos, but didn't have a clue what it was. I can say that you used these pigment powders beautifully. I appreciate your comparison study. Interesting stuff Yogi.....would you use them to write with a broad edged nib or even a copperplate nib?